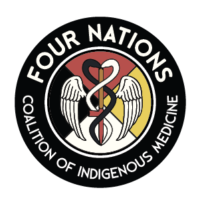 At the Four Nations Coalition of Indigenous medicines we are dedicated to offering teachings and services that enhance all people’s connection to nature, their creators and each other. We want the world to be beautiful, vibrant and healthy for many generations to come, and we want to co-create that beautiful world with you! We believe that to achieve that goal we have to share the deeply wise teachings that our ancestors acquired and bridge them with the incredible technologies and innovation that our modern world has to offer. We offer programs that educate children, youth and adults in earth honouring traditional indigenous teachings from the four nations of humanity. From fun and creative child and youth programs to deeply transformative adult education and personal healing we offer our gifts to you all. May we all contribute to a world brimming with joy, love, tolerance, respect and good health for all nations! Our Outdoor Education Program is sanctioned and supported by our Indigenous hosting nation; the Sinixt. Please contact Taress Alexis with any questions regarding this territory and their protocols. We are located in the beautiful Slocan Valley and facilitate programs from various locations in the community. Our home office and 5-star rated rustic retreat centre is a beautiful straw bale timber frame home located on an acreage just steps from airy creek and a short drive to the confluence of the Slocan and Little Slocan Rivers. This area is deeply steeped in history and medicine as we live near to an ancient Sinixt (Interior Salish Indigenous Nation) village site that once flourished here. The area also hosts a variety of activities for the outdoor enthusiast; we are minutes away from Rails to Trails for hiking, biking, skiing and horseback riding, we sit on the boarder of Valhalla Provincial Park; home to extraordinary hikes, mountaineering and backcountry skiing, beautiful beaches are close by and we are within 40 minutes from the Castlegar airport as well as the historic city of Nelson BC. To provide exceptional indigenous cultural education and wellness programs in a engaging, safe and inspiring environment to people of all four colours. Kathryn was raised in the Gitksan (Coast Salish) culture on a remote reservation in Northwest British Columbia, Canada. She is a Chanumpa (Sacred Pipe) Carrier in the Lakota tradition, having apprenticed with the late Grandfather Wallace Black ELk (Lakota) for over seven years. Kathryn was handed the responsibility of carrying the holy chanumpa and the inipi (sweat lodge) altar by Wallace Black ELk and has dedicated her life to serving Mitakuye Oyasin(All My Relations). Kathryn has also spent over thirteen years studying Indigenous healing practises and apprenticing under her beloved Brazilan parents, Chore and Clotilde Santos(Canamari nation); Peruvian Healing practises with her Quechuan teacher and lived extensively in Aotearoa with her Maori family. Kathryn is a much sought after Aboriginal Cultural Consultant, Traditional Knowledge Keeper, educational program planner, outdoor Aboriginal educator and Ceremonial facilitator. She has recently received a national award for a program she designed and spearheaded for the best traditional Aboriginal Educational program in Canada. Kathryn currently resides with her family in the Sinixt Territory in the Arrow Lakes region of British Columbia; just outside the town of Nelson. She is a welcome guest of the Sinixt people and adheres to all their sacred laws and protocols while living and working in their H’a H’a Tumxulaux (sacred land). Kat won a national award through the Canadian Education Association for the best Cultural Outdoor Education program in Canada. Learn More. Kat is a CBEEN educator: See CBEEN Programming. Jessica is a passionate teacher-facilitator and indigenous medicines practitioner. Through the mediums of shamanic journeying, sacred art and her traditional medicine practice, Jessica brings to life the very essence of magic present in our world. She graciously teaches us to integrate the sacred into our daily lives through pragmatic application and creative bliss, helping us to honour and celebrate each individual`s role in this intricate and beautiful web of life. Jessica is the co-founder of the Four Nations Coalition of Indigenous Medicines, is a sacred pipe (chanupa) carrier trained through the Lakota lineage of Wallace Black Elk and her teacher Kathryn McCooeye. She enthusiastically facilitates vibrant earth honouring children’s programs, is a trained Birth Doula and has a thriving medicine practice. Jessica has completed an eight year full-time apprenticeship with Kathryn McCooeye in Indigenous medicines. She has studied in the Amazon Rainforest with the Canamari people, and is a Reiki and Healing Touch practitioner. Her background working with people of all walks is well rounded, from YMCA residential camp counsellor and youth recreation instructor to teacher’s aide at a high risk high needs inner city preschool, to volunteer work at the Calgary Between Friends Club (a program facilitating recreation programs for people with disabilities). She has worked as a care aid to the elderly infirm in England, a scuba dive master in Thailand, and volunteered as a care- giver at a Romanian orphanage. She is also a gifted artist in a wide range of mediums and is currently studying to become a licensed herbalist. Jessica loves every minute of being a mom (well, almost! ), and is deeply committed to serving others, celebrating life, creating beauty and lifelong learning. Private and group healing sessions are offered in Nelson, BC at the Solace Integrative Health Centre @ 823 Baker Street! Mireille’s love for the natural world was deeply seeded as a young child growing up exploring the majestic mountains and rivers of the Kootenay Valley of BC. Observing the injustices of the world, inspired her to dedicate 10 years of her life to social and environmental education and activism across Canada and in various parts of the world. During this process, Mireille realized that the root of the problems she was observing stemmed from people’s lack of connection to the natural world, one another and themselves. This inspired Mireille to dive into learning about the ancient ways when people lived in harmony with the land. This included 6 years of Earth Studies with Four Nations Coalition of Indigenous Medicines, the Anake program at Wilderness Awareness School, Natural Building with The Mud Girls and permaculture classes. Mireille is a sacred pipe (chanunpa) carrier trained through the Lakota lineage of Wallace Black Elk and her teachers Kathryn McCooeye and Jessica Bamford. Mireille’s love for children has inspired her to co-facilitate earth connection programs with the Four Nations Coalition, worked as the Adventure Based Learning Specialist with Take a Hike Foundation for at risk youth, led Endless Adventures Youth Camp, Assisted at Kids’ Tipi Camp, was a counsellor at YMCA Summer Camps and coached several sports. She is also a member of Nelson Search and Rescue. Mireille combines her contagious love for nature with her passion of play to help others access their inner child and curiosity to explore the mysteries of how we can use the plants and animals around us in a harmonious way for tools and medicine. She can’t wait to meet you and facilitate opportunities for you to create beautiful relationships and creations with the natural world. Four Nations staff are supported and held accountable by a counsel of incredible individuals who are caring, professional community members; Lindsay Morris, Suzanne Morris, Fonda Pusey, Janene Bate Stein, Bonnie Vickers, and Kathy Spears. We are also in consultation with the Sinixt Nation in all our endeavours.